If there's a series that lends itself to "binge reading," it's JT Krul and Freddie Williams's Captain Atom. In the first volume I liked their new Nathaniel Adam but found the book directionless; the second volume, however, Captain Atom Vol. 2: Genesis, not only tops the original in weird science, but also applies a significant amount of direction to the seemingly disparate elements of the first, redeeming the series as a whole. This is a book that doesn't work if you just read one issue or one trade, but that works immeasurably well once you've let a dozen issues go past (I feel similarly about Matt Kindt's Mind MGMT). More's the pity that there was no way to read it like this from the outset; here's a cancelled book that left me hungry to know what happened next. Genesis is a head-trip of a book, one that takes the title character into the far future, then wraps around back to the very first issue, before actually changing the events of the first volume and then proceeding to tell a story within the revised reality. Again, Krul's characterization of the Dr. Manhattan-eqsue Captain Atom (itself a temporal example of the original influencing the new, influencing the original) is the best part of this book; Krul proves how well he knows his character in that he can untangle the threads of what motivated Captain Atom at each moment, alter it, and then proceed to tell a story about the same character even with a slightly revised outlook. Much of what I liked here is the same as what I liked about the first New 52 volume of Flash -- Krul isn't afraid to be brainy, and to tell a complicated science-fiction tale with twists and loops in it. This isn't just a time-travel story where the character is stranded in the future for a while (though it has that, too), but one again that deals with causality and alternate realities, the kind of science-fiction one sooner sees in novels than in comics. Significant credit, however, has to go to Krul's collaborator Freddie Williams. What really makes Genesis are the character designs of the future Captain Atoms who enlist our own to prevent the destruction of Earth -- weird alternate versions, many influenced by religious symbolism, with not just a little of Dr. Manhattan in there again as well. On top of the wild two-page spreads Williams offers, the panels that bleed and blend into one another, and the targeted coloring that sets Captain Atom apart from the other characters, Williams's future Atom designs are different from how many artists usually depict the future -- no heavily armored, tricked-out costumes -- and I thought this demonstrated a lot of imagination. Krul's final Captain Atom volume includes the four-part time travel story, and then a two-part story set in the "new reality," plus the Zero Month issue. The two main parts work especially well together, as the time travel story is understandably cosmic, and then the finale is more relaxed, of sorts, with a human Nathaniel Adam and some good sci-fi horror. Even here, however, Krul plays with perspective, questioning what is and isn't real -- is the human Nathaniel Adam that the reader follows really "there," or is he part of the same wish fulfillment that brings one character's mother back from the dead? There's an Alice in Wonderland element here, in which the reader isn't sure if they're part of the dreamer or the dream. Things unravel fast for Atom in the end; it's only about the span of two pages in which he realizes that, whereas he thought he had a new lease on life as Nathaniel Adam, Atom must instead completely separate himself from humanity for their safety (at least until Firestorm Vol. 3). Undoubtedly some of this swiftness comes from the cancellation of the book and the truncating of whatever stories Krul might've had planned. 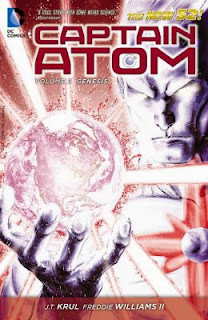 I'd like to think that if the book hadn't ended, we might've seen more of the human Nathaniel, separate from or working with or against Captain Atom; many times, especially toward the end of the pre-Flashpoint universe, Captain Atom and his human self were inseparable, and so it's interesting to get this new perspective and see an aspect of Atom not recently explored. I also continue to appreciate that Krul's "Captain" Atom is not a military cliche, but rather he makes his own decisions while still respecting his former service. The Zero Month issue, something like the Voodoo issue and others, doesn't necessarily tell us more about Captain Atom than we knew before, though it's a nice one-off tale with an ending more hopeful than the ending of the regular series. The Dr. Manhattan vibe is strong here, too, especially in Adam's reformation as Atom some weeks after his accident. The character that Krul creates -- both here and throughout the book -- is something like "Dr. Manhattan with a heart"; the New 52 Captain Atom is largely more powerful, more godlike, than the pre-Flashpoint Atom ever was, but neither is he as aloof as Alan Moore's Manhattan. Whereas Manhattan's story must necessarily be about the people around him, with the added emotionalism Krul can preserve Atom as the star of his own story and at the same time imbue him with some of the wonder that previous versions of Captain Atom lacked. My recommendation remains that if you're curious about JT Krul and Freddie Williams's Captain Atom, sit down with both trades or load up all the issues on your device and read them as if they were one. The first volume is a good-looking, enjoyable book, but Captain Atom Vol. 2: Genesis is the real star of the show, enhancing the first volume and distinguishing itself at the same time. I'd be happy to see Krul and Williams get another shot at Captain Atom in the future.